Around 400km to the south of Shanghai, there is a mountain called Tiantai which is named after the constellation Tai and thought as the symbol of this constellation on earth. 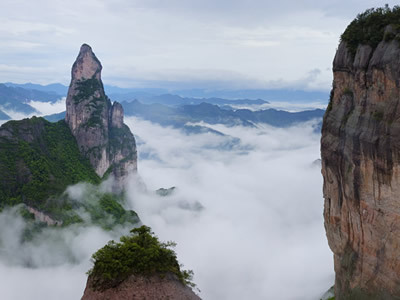 There is also a mountain area which name is Xianju which means Celestial Being Stay – Legend says immortals took this area as their land for its fairyland like scenery. Guoqing Temple at the foot of Tiantai Mountain is the site where indigenous Chinese Buddhism branched away from Buddhist teachings and doctrine commonly found in India. From there, the Tiantai Sect of Buddhism spread to both Korea and Japan during the Tang Dynasty (618–907 AD). The tall brick Guoqing Pagoda built at the temple in the year 597 AD is still standing, making it one of the oldest surviving brick pagodas in China. Tourists will also take the bamboo raft to drift along the wonderland like Yong’an Stream and visit ancient Potan Town to enjoy the carefree, snug, tranquil and serene atmosphere there. Tiantai Mountain, Guoqing Temple, Shiliang Waterfall. * To relax yourselves and know more about ancient Chinese arts and culture by visiting mysterious but graceful Guoqing Temple which is also called the Buddhist Mecca in China. * Indulging in the fairyland landscapes in Xianju Mountain and drifting in the wonderland-like Yong’an Stream. * Experience the unique culture, folk custom and local food at ancient Potan Town. 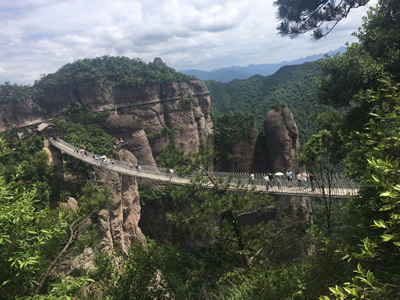 With unique geography, tranquil flora comprised of evergreen plants and many historical sites, Tiantai Mountain (Tiantai means "a constellation named Tai in sky") is a famous national scenic area situated in Zhejiang Province, around 380km (4.5 hours ride) to the south of Shanghai. It is well-known for its picturesque scenery and for being the Buddhist Mecca. Guoqing Temple (Guoqing means Pure Nation) at the foot of Tiantai Mountain was built in 598 in the Sui Dynasty，renovated several times in later dynasties. The existing buildings were those rebuilt in 1734. It is the cradle of the Tiantai Sect of Buddhism. Master Zhiyi, who designed the temple, was also the founder of the sect (though, to honor his teachers, he is called the Fourth Patriarch). Before Zhiyi created this systematic teaching, all Buddhism in China was based on Indian models. This, then, was the first truly Chinese system of the Buddha’s teachings. The teaching was carried to Korea and Japan (where it is called “Tendai”) in the Tang Dynasty (618-907). This temple is one of the best preserved large temples in China. It covers an area of 19,600 square meters with 14 halls and over 600 rooms in the temple. The architecture is grand and unique. Its main body consists of four vertical axes and such main buildings as Maitreya Buddha Hall, Main Hall, Kwin-yin Hall, Bell Tower, Drum Tower, Abbots Room, Sutra Hall, etc. stand on these axes. The Statue of Sakyamuni in the Main Hall is cast by bronze, and weighs thirteen tons. The fresco Leading People from Earthliness to Buddhism behind the statue of Sakyamuni is drawn delicately, with high artistic value. By left side of the Main Hall, you can enjoy an ancient plum tree in the parterre. It is said that the plum tree, with an age of more than 1,300 years, was planted by the first abbot of this temple in the Sui Dynasty; therefore, it has a popular name: Sui Plum. Maybe it is the oldest extant plum tree in China. The tall brick Guoqing Pagodabuilt at the temple in the year 597 AD is still standing, making it one of the oldest surviving brick pagodas in China (after the 40 metres (130 ft) tall Chinese Songyue Pagoda built in 523 AD). Shiliang Waterfall is a masterpiece of nature near the temple. A stone beam spans two steep cliffs, known as Shiliang, a so-called Stone Bridge, ranges from 19 centimeters wide at the narrowest and to about 48 centimeters at the widest point. The waterfall plummets 30 meters into a deep pool with a thundering roar. The sight is magnificent. Considerable composure and surefootedness are required to walk across the beam. Your private guide and driver will be on time and wait for you at your address in Shanghai and drive to Tiantai County, Zhejiang Province in the morning (Tiantai means "a constellation named Tai in sky"). After 320km/5 hours drive, you will arrive at Tiantai County. After lunch, you will visit Guoqing Temple at the foot of Mt. Tiantai. Rebuilt in 1734, this temple is one of the best preserved large temples in China. It is the cradle of the Tiantai Sect of Buddhism, the first truly Chinese system of the Buddha’s teachings created by Master Zhiyi, who also designed the temple. Afterwards you will visit Shiliang Waterfall in Mt. Tiantai near Guoqing Temple. A stone beam spans two steep cliffs, ranges from 19 centimeters wide at the narrowest and to about 48 centimeters at the widest point. The waterfall plummets 30 meters into a deep pool with a thundering roar. The sight is magnificent. As the day draws to an end, check in the hotel at Tiantai County. In the morning, you will drive from Tiantai County to Mt. Xianju in Xianju County (Celestial Being Stay) (around 110km/2h). Sightseeing at Mt. Xianju (cable car up and down the mountain). Xianju, means Celestial Being Stay, is a county around 80km to the south of Tiantai County. It is so named because of its fairyland like scenery. This mountain area is famous for its grotesque peaks, deep and serene valleys, picturesque forests, spectacular waterfalls. Legend says celestial beings chose here as their land for its picturesque mythical landscape. The tour today will begin with the drifting along Yongan Stream. The stream is as long as 7.68km. Here the crystal water is clear to bottom. Hills on both sides of the stream are green and charming. Sitting on the bamboo raft, flowing on the stream gently, sometimes rapidly over shoals, tourists would get away from the noise and pollution of the city and indulge in the carefree, snug and quiet atmosphere in the crystal water, blue sky, green mountains surroundings. Afterwards, you will visit the ancient Potan Town. The natural beauty of the town is indescribable. Ancient cobbled streets, old trees and old-style dwellings, as well as the local costumes and local food, create an ideal civilized, rich, pastoral and harmonious environment. A walk in the ancient town is said to be a walk into history frozen in time, tranquil and serene. 1. Three days private car with parking fee and highway fee from Shanghai. 3. Entrance ticket to the attractions as listed in the itinerary, Include cable car up and down Mt. Xianju and drifing on Yongan Stream.